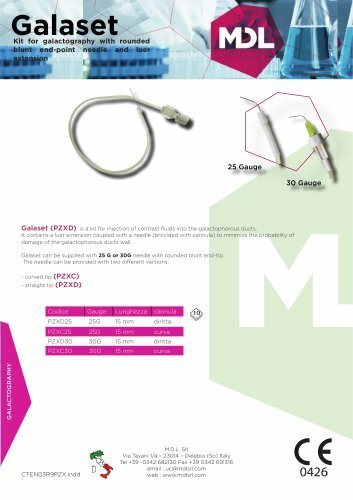 Kit for galactography with rounded blunt end-point needle and luer extension Galaset (PZXD) is a kit for injection of contrast ﬂuids into the galactophorous ducts. It contains a luer extension coupled with a needle (provided with cannula) to minimize the probability of damage of the galactophorous ducts wall. Galaset can be supplied with 25 G or 30G needle with rounded blunt end-tip. The needle can be provided with two different versions: - curved tip (PZXC) - straight tip (PZXD) M.D.L. Srl Via Tavani 1/a – 23014 – Delebio (So) Italy Tel +39 -0342 682130 Fax +39 0342 691316 email : uc@mdlsrl.com web : www.mdlsrl.